I produced the three volumes that make up this set for my own micro-boutique/audiophile label John Marks Records, commonly known as JMR. The idea was to present traditional and sacred Christmas music in straightforward, un-gimmicky arrangements, recorded in orthodox stereo (so to speak) in an acoustically-appropriate space. 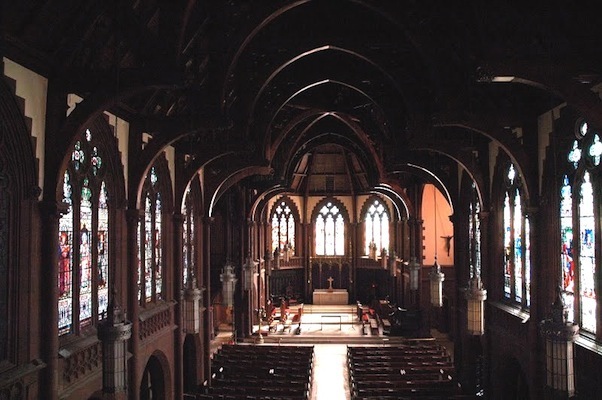 In the case of Volume One, that was New York City’s Holy Trinity Church, a photo of which can be found after the jump, along with sound samples. An especially welcome holiday album is the new “Rejoice: A String Quartet Christmas” from John Marks Records. … “Rejoice” contains 24 carols arranged lovingly for strings. A first-class string quartet plays tasteful arrangements … in refreshingly ungimmicky style. Warmly recommended for those who like the tunes better than the words. 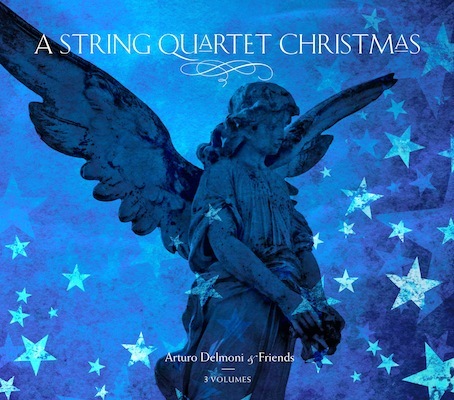 A simple string quartet breathes new life into Christmas classics … brings out the natural beauty in the songs of Christmas. This album will substitute nicely if you won’t be having a live string quartet at this year’s Christmas party. These carols arranged for string quartet are done straight, not tongue-in-cheek as in the “What If Mozart Wrote…” series. The instrumentalists are top flight, including star cellist Nathaniel Rosen. This may be the ideal background CD for Christmas Day… . Yuletide listening doesn’t come any mellower than this. Those reviews opened the doors for two major live performances. The first was Sunday morning December 10, 1995, on the NBC Today Show, followed by National Public Radio’s Performance Today, December 22, 1995. That level of national exposure pretty much cleared the shelves nationwide, and demand continued into the New Year. I was tickled pink a couple of years later when the daytime drama The Young and the Restless chose excerpts as production music for their installment of Christmas Eve, 1999. When Steinway & Sons launched their classical-music e-tailing business Arkivmusic.com, they approached me about licensing the titles, which I was happy to do. They eventually inquired about whether I would be willing to sell the masters, which I was also happy to do. Steinway & Sons Recordings repackaged the three volumes as one set, which is available right now, sale-priced from Arkivmusic.com. As far as I know there are no CD Quality or better downloads; but, the 3-CD set is available via multiple streaming services and MP3 downloads. Katherine Murdock (viola), Nathaniel Rosen (cello), Arturo Delmoni and Alexander Romanul (violins). Arturo Delmoni and Nina Bodnar (violins), Natasha Lipkina (viola), Nathaniel Rosen (cello). Arturo Delmoni and Danielle Maddon (violins), Ellen DePasquale (viola), Nathaniel Rosen (cello).